A Group Designed to Deliver Bluhull Group is geared to provide fast efficient, hands on, service to the Marine and Oilfield Business. The Group brings a wealth of valued reputation and experience in the Industry with direct involvement on board drilling installations and marine vessels, project management and personnel management. A team of experts and professionals striving to maintain, preserve and develop a progressive and advanced business approach. They analyze the market needs and demands. Trained personnel motivated to respond proficiently while working to meet with the Clients� requirements. The Bluhull team is dedicated to produce and develop individual growth. Sharing resources and develop innovative strategic plans in alliance with a global business network; Through active and constant networking Bluhull Group seeks to constantly adjust to the shifting global markets, social and technological trends ensuring it remains alert of the needs of the Industry at all times. Jonathan has a collective span of over twenty five years of experience in various sectors within the oil and gas industry with direct involvement and substantial time spent offshore on various drilling units worldwide. Through years of service to the industry, Jonathan has garnered a deep understanding of what the industry�s requirements and priorities are. By applying such knowledge and business development abilities to oil and gas projects, Jonathan founded, developed and sold a number of companies operating in the industry. Today he is a Director of four companies with interests in the oil, gas and logistics sectors. In the past fifteen years Sharon acquired an enviable reputation as an expert in the Oilfield Human Resources Sector. Sharon�s Human Resource skills have gained the trust and respect of several governmental entities, drilling contractors and stake-holders in the industry. Her capabilities encompass the management of human resource screening, selection and development areas of employees, and the prompt feedback and communication with a clientele that includes multinational drilling contractors, service companies and oil operators. In April 1st 2014, Sharon Cassar Borg was appointed the Quality Executive for Bluhull Group and is increasingly involved in the execution of international contracts. Pierre joined the Oil and Gas Service Industry in 2009. Involved in the financial aspects of various business sectors he brings over thirty years of experience in different industries, varying from imports, manufacturing, catering and leisure. In 2012 he joined Bluhull Marine Ltd., as a Financial Controller, and in 2013 was a catalyst in the formation of Bluhull Group. In this new post, apart from providing financial, commercial and strategic support to the Group, he is also responsible for all the financial aspects ensuring compliance of all statutory and corporate commitments. Patrick developed his career in the shipping and logistics industry and carries over twenty years of experience in this sector. Over the years Patrick has provided and managed port agency and logistical services to almost every sector in the field, from General Cargo, Container Liner, Tanker, Cruise Lines, Naval Forces, and of course the Oil & Gas sector. Having gained valuable experience and having access to an international network of service providers and suppliers through the ever growing diversity of requirements in the sector, he has managed several projects, including vessel repair, dry-docking and conversions, new builds, SPSs and Rig Lay-ups, shore based equipment management, storage and inventory control, including all the ancillary services connected with the respective project. Ralph has a distinguished record of developing businesses in new, emerging and established markets across the globe for both market leaders and start-ups in the oil and gas industry. He is a former Vice President of Worldwide Sales for National Oilwell Varco based in Houston and served in similar capacities at @Balance, a Shell venture company in Houston and for drilling contractor Smedvig in Singapore. Ralph was also responsible for global business development for two Limerock venture companies, IDM International based in London and then Dubai and TWMA based in Dubai. More recently Ralph has ventured into Business Development opportunities. Based in Dubai he provides advisory services for tendering processes and business development expertise in new and existing markers. Paul King brings a wealth of over thirty five years experience in the Oilfield Industry to Bluhull Group. Paul is the former Managing Director for Transocean Deep Water Drilling in the North Sea, UK. He was responsible for setting up shop in Aberdeen and the day to day management and direction of Transocean�s UK operations. After serving five years in offshore positions, Paul completed a further six years onshore, mainly as an electronics engineer. 24 years within increasingly important managerial positions spent overseeing Tansocean�s operations in the UK, US and Brasil, culminated in Pauls� current position. He also served as Vice President of Operations in Houston, Texas for two years and is a former Chairman of the British Rig Owners Association, a Former Chairman of the IADC North Sea Chapter, and a member of OSPRAG, reporting on the Macando Well Gulf of Mexico Oil Spill. The mission of Bluhull Group in their own words. �The Mission of Bluhull Group is to contribute and provide an optimum service to the Oil and Gas business while cultivating and developing the potential of our proximate assets. We operate our Business to the maximum ethical Values, where Quality, Safety and Rules of Free Competition are fully recognized and perceived, in conformity with applicable laws including international anti-corruption acts. The Group�s quality system is in place to guide us achieve, sustain and continuously strengthen our structure to complete and deliver all the projects entrusted to Bluhull Group in the most efficient and safe manner. At Bluhull we care about our employees, stakeholders, clients and alliances and that is why we are committed to watch and measure our operating system continuously and adjust to market demands and beyond. Bluhull Group are dedicated to carry out business with honesty, equality and transparency. This is exposed in every aspect of their business affairs. This Policy outlines the standards and behaviours that Bluhull Group upholds as a company, to ensure that the highest standards of integrity are maintained. Bluhull Group recognises that different practices apply across the world, including within the territories in which they operate and that normal practice in one place may not be acceptable in another. However, it is Bluhull Group�s policy to comply with all laws, rules and regulations governing bribery and corruption in all the countries where they operate. Bluhull Group is a recognized leader in sourcing extensive service solutions to the Oil & Gas Industry which satisfy the Client�s and Regulator�s requirements in an effective, efficient and safe manner. The Health and Safety of it�s people is the company�s responsibility and commitment. They firmly believe that a good communication system is the key element to achieve their goals safely while keeping good health and a safe working environment. �	Bluhull Group holds an in-house Vessel Port Agency to consolidate the �One Contact, One Contract� philosophy. �	The Bluhull team provides port agency and logistical services to almost every sector in the field, from general cargo, container liner, tanker, cruise lines, naval forces, and with a special focus to the Oil & Gas sector. Bluhull Marine Agency is the Agent for the Drilling Contractor. The company understands your operation and will deliver your demands quickly, efficiently in a cost effective and safe manner. Bluhull Marine Agency will manage all aspects of Port Agency and Husbandry Services in all Maltese Ports and Offshore. They bring a wealth of oilfield, shipping experience and well developed local relationships with port authorities, contractors and suppliers. With the support of selected suppliers Bluhull guarantees a quick, cost effective turnaround to their principals, from a simple off-harbour call for logistical requirements; crew transfers, customs documentation, provisions, supplies, bunkers, to a full cargo operation or a shipyard rig-fit project. Bluhull�s in-depth understanding of upstream, downstream and project activities means we that they are ready to mobilize resources according to your needs. They will organize and deliver spares and equipment wherever you need them quickly and efficiently. Moreover Bluhull will look after your interest for a cost effective process while conforming to health and safety regulations. Bluhull�s dedicated team supports you with a comprehensive range of solutions, from chartered or scheduled air and ocean transportation to overland logistics and final delivery. �	Successes in today�s business environment demands supply chain strategies that are creative, practical and realistic. Bluhull logistics leverages its experience in the Oil and Gas exploration drilling industry to develop achievable supply chain strategies linked to business goals. �	This Supply Chain Management experience puts together an advanced transportation-modelling, inventory simulation, facility storage design and business process engineering designed together to create the most efficient operating environment for your operations. Bluhull Rig Move Services provides quality Marine, Engineering and Safety Consultancy Services to the marine rig move sector. The Company is a BIMCO broker of Anchor Handlers, Tug Supply vessels (AHTS) and Platform Supply Vessels (PSV). The Group has a worldwide operation, with particular focus on the Mediterranean, North Africa, the Arabian Gulf, North Sea and the South East Asian Sea. Bluhull Group is an independent service contractor with extensive business alliances selected to compliment and accomplish complete provisions required by our clients. 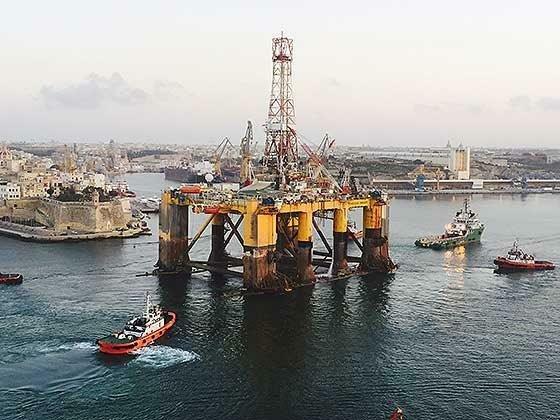 Bluhull will identify and provide the right Rig Stop Facility; Berthing Quay, Yard Stop and Storage Facilities in the Mediterranean, North Africa and the UK. The facilities offered are Secure Storage Facilities, monitored with CCTV cameras within an enclosed custom area, under lock and key including Gate Keepers 24�7 and is accessible 24 hours x 7 day a week. Yards have the capability and equipment to accommodate any type of vessel. Bluhull Projects will take on and manage Projects entrusted to them by their clients from start to finish, minimizing the number of additional contractor interfaces and inevitably freeing up valuable clients� time. Bluhull will source a range of painting equipment and accessories to deliver turnkey painting projects for their clients. Bluhull Projects works within the IRATA international code of practice. This has proven to be a safe process of working at height, which in turn can save their clients valuable time and resources. Bluhull is a local supplier of scaffold and alternative access services to onshore and offshore oil and gas industry. They play a key role in supporting major players across a variety of industrial sectors. The company�s access equipment is manufactured to internationally recognised standards for safety and reliability. Bluhull�s appointed, qualified engineers will provide design schemes specific to each project and clientiability.gas industry. They play a key role in supporting major players across a broad spectrum. Bluhull will design safe access systems. Bluhull Projects offers an integrated range of underwater Inspection, Repair and Maintenance services. Their partners� experienced divers will operate from self-contained dive spreads, using surface supplied air, and all their divers are qualified in line with the International requirements, which govern the technique in the offshore commercial diving industry. The company culture a strict safety procedure, and clients may be certain, that their underwater services will be executed safely, and within a timely manner, efficiently and professionally. Bluhull Group offers the opportunity to take on and manage Rig Stops / Project Support Services and any Engineering Project required from start to completion, minimising the number of additional contractor interfaces and inevitably freeing up valuable clients� time. Bluhull Resources is a licensed, recruitment agency that offers the provision of Permanent Staff, Contract and Adhoc Personnel Worldwide. Bluhull�s human resources team is competent and dedicated to discover the abilities of every individual, understand the personal goal and placing the right candidate to the right job. Bluhull Resources offers a high level of expertise in the Human Resources Management exclusively to the Energy Industry. The company understands clients� requirements and personnel because it shaped itself in the oilfield industry. Bluhull maintain an extensive in-house multinational database of experienced personnel worldwide and all candidates are screened and interviewed through a high standard procedure in place to identify the right candidates for the right job. Bluhull Resources offers all levels of Offshore and Onshore experienced Drilling Crews, Marine Crews, Rotating Paint Crews as well as New Hands � Trainees/Fast Trackers � Engineers. Bluhull�s people excel because their project managers guide the progress of every project and resources are trained to perform in the most difficult conditions. Their experience has taught them the true meaning of �no downtime�. By communicating regularly with clients, they affirm their satisfaction. A client would know the company listens to their concerns and respond readily to their needs. Bluhull offers the highest quality personnel to support well management in both technical engineering and operations management. From a single engineer for a short term placement, to an entire drilling department on a long term basis, BHR provides the right people at the required time. The Bluhull Personnel Management System is in place to deliver an optimum service to Clients. The company emphasizes it�s screening procedure to source the right candidates to the right job. In collaboration with clients and their specific requirements Bluhull Resources manages International recruitment campaigns. Bluhull works in alliance with several unique, reputable companies which provide key element support to the Industry and it is exactly this synergy that allows them to accomplish and deliver Total Product Solutions. Submarines & Submersibles Bluhull Group are the Agents and Representatives for SEAmagine Hydrospace Corporation, California U.S.A, which is a leading designer and manufacturer of small personal submarines and manned submersibles for professionals with over 12,000 dives accumulated by its existing fleet. The company produces small personal submarines and manned submersibles with depth ratings from 150 meters to 1500 meters deep. All personal subs offered are based on the company�s patented submarine technology that provides excellent surface stability as well as superior underwater performance. These personal manned submersibles are ABS or DNV-GL classed and the subs are also approved for the Cayman flag. These state of the art personal manned submersibles are robust, safe, and practical, holding 2 to 5 occupants, and offering excellent field of views. The submarines allow easy entry and exit from any private or commercial vessel. In surface mode, the patented flotation systems permit these private submarines to float high above the water line with a high freeboard when docked to the support vessel. When submerged, the personal submersibles are positively buoyant at all times and, should the thrusters stop, the submersibles will gently rise back to the surface. Underwater, these submarines remains horizontal at all times and do not roll or pitch. When these personal submersibles are near the surface at the end of a dive, their flotation systems are re-inflated such that the submersibles float back on the water�s surface at which point they are docked back to the support vessel or quay. SEAmagine Hydrospace Corporation has a long history producing its personal submarines and deep-sea submersibles. The company�s manned submersibles have performed thousands of dives around the world in a wide range of different sea conditions from many types of vessels, including superyachts and commercial work boats. These personal submarines and private submersibles have been used in scientific, commercial, and private superyacht industries and have also been used in National Geographic, BBC, and other numerous film projects. SEAmagine has a perfect safety record and a solid track record in reliability and practicality in both the commercial and superyacht markets. Bluhull Group takes pride in representing and acting as Agents for SEAmagine Hydrospace Corporation, offering a range of submersible models with depth ratings from 150 meters to 1000 meters. The full solution involved with these personal submarines and manned submersibles will be introduced as a new concept for the oil and gas subsea and under water inspection services. This manned solution is by far the safest manner in which Drilling Contractors and oil exploration operators can carry out deep-sea inspections and other related underwater surveys. All of these personal submarines and manned submersibles are classed by the American Bureau of Shipping (ABS) or DNV-GL and approved by the Cayman Islands Shipping Registry (CISR). Bluhull Group, as agents for Trelleborg Marine Systems, will help you define the ideal marine fender for the structure, the best materials for the environment and the best design for long service life and low maintenance. Trelleborg Marine Systems is a world leader in the design and manufacture of advanced marine fender systems. These high-performance solutions combine low reaction force and hull pressure with good angular performance and rugged construction. High performance fenders are used wherever demands are greatest: LNG and oil terminals, container quays, RoRo berths and bulk cargo facilities. All high-performance fenders are PIANC type-approved. This means Bluhull has demonstrated the performance of full size marine fenders to independent inspectors (Germanischer Lloyd) and determined the effects of different compression speeds, temperatures, angles and fatigue. PIANC recommends that manufacturers should have type-approval certificates in accordance with PIANC guidelines, something Trelleborg Marine Systems is proud to provide its customers. Total mooring solutions (TMS) from mooring design and engineering, rig moves, AHTS�s, PSV�s, full support equipment mobilization, deployment and recovery. Bluhull offers a complete range of mooring products and support service including attention to comprehensive range of equipment handling, inspection and repairs programs. Focus is given to the provision of total mooring solutions (TMS) from mooring design and engineering, rig moves, AHTS�s, PSV�s, full support equipment mobilization, deployment and recovery. Including drill tool rental, tubular rental, casing and tubing running services. Bluhull will deliver safely and efficiently. A division within Bluhull, Bluhull Well Services, supplies a wide range of provisions to the Oil and gas Industry. The service range covers drill tool rental, tubular rental, casing and tubing running services. The company aims to provide an excellent service according to the client�s demands. They deliver and source the safest and most efficient services using remote-operated technology. �	Subs, valves, pup joints etc. Bluhull is an exclusive sales representative for Discovery Drilling Equipment Ltd�. They supply a wide range of drilling equipment for offshore and onshore rigs that require replacement parts and rig fit refurbishment. They also supply and provide products with the safest, efficient delivery, supported by their own local and regional aftermarket support network. All Equipment is API certified (API monogram), ISO certified and as required with regional certifications such as CE and Atex. The Human Asset is the World�s strongest asset. At Bluhull Resources we work to maximize the potential of each individual and to develop further on the personal qualities, qualifications and experience.